The first wave of VAT implementation and reporting has been completed. We interviewed organizations from diverse industries in the United Arab Emirates and the Kingdom of Saudi Arabia to gain insight into their experiences and challenges. Last year, our survey focused on VAT readiness - and the research revealed that 38% of companies lacked VAT management expertise in-house and only 29% had IT systems in place that could support VAT compliance. 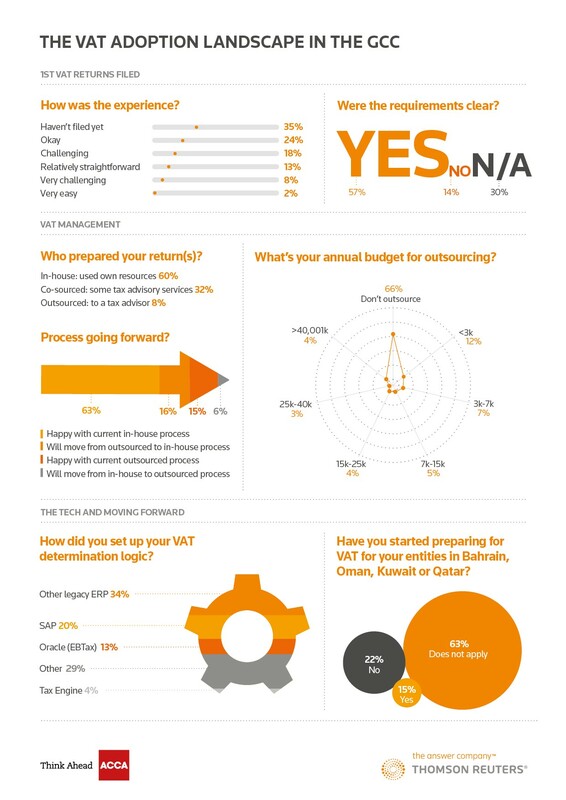 One year later, the VAT Return Filing and Compliance Survey 2018 conducted by Thomson Reuters and ACCA aims to gauge how well these companies have fared to adapt to this fiscal reform. Please complete the form on the right to download a copy of the full survey findings and overview infographic. For more information about the Thomson Reuters Indirect Tax solutions or to request a demonstration, please click here and a member of the Tax & Accounting team will contact you. Please complete the form below and a member of the Tax & Accounting team will contact you. Thank you for your inquiry. A member of the Thomson Reuters MENA team will get in touch with you shortly. You will receive the infographic by email shortly.